A video projector is placed in the middle of the room. Immediately in front of its lens a rotating platform with glass prism is placed. 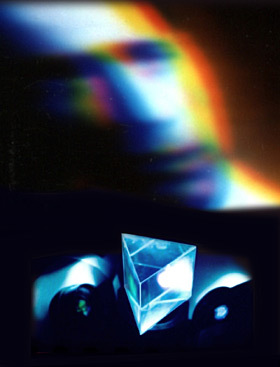 Video projection shows a famous film "Casablanca", but as it is optically refracted through the rotating prism the narrative and the characters of the movie are constantly displaced and fragmented. The viewer will simultaneously observe several fragments of the same frame or sequence as they travel around the walls of the room, divided in space and spectral colours.